The Holocene epoch begins 11,700 years BP (10,000 14C years ago). 2 were emitted, produced the "Year Without a Summer"
The "Mysterious 1810 Event" VEI 6-7; discovered from ice cores in the 1980s. 2 were emitted, produced a Volcanic winter, 1783, on the North Hemisphere. 10 October 1465 mystery eruption "the location of this eruption is uncertain, as it has only been identified from distant ice core records and that of the wedding of King Alfonso II of Naples; it is believed to have been VEI 7 and possibly even larger than Mount Tambora's in 1815. 1257 Samalas eruption, Rinjani volcanic complex, Lombok Island, Indonesia; 40 km3 (dense-rock equivalent) of tephra, Arctic and Antarctic Ice cores provide compelling evidence to link the ice core sulfate spike of 1258/1259 A.D. to this volcano. This is a sortable summary of 27 major eruptions in the last 2000 years with VEI ≥6, implying an average of about 1.3 per century. The count does not include the notable VEI 5 eruptions of Mount St. Helens and Mount Vesuvius. Date uncertainties, tephra volumes, and references are also not included. Kuwae New Hebrides Arc 6 1452-53 2nd pulse of Little Ice Age? Baekdu Mountain/Tianchi eruption China/ North Korea border 7 946, Nov-947 Limited regional climatic effects. Note: Caldera names tend to change over time. For example, Okataina Caldera, Haroharo Caldera, Haroharo volcanic complex, Tarawera volcanic complex had the same magma source in the Taupo Volcanic Zone. Yellowstone Caldera, Henry's Fork Caldera, Island Park Caldera, Heise Volcanic Field had all Yellowstone hotspot as magma source. 2.588 ± 0.005 million years BP, the Quaternary period and Pleistocene epoch begin. Eifel hotspot, Laacher See, Vulkan Eifel, Germany; 12.9 ka; VEI 6; 6 cubic kilometers (1.4 cu mi) of tephra. Emmons Lake Caldera (size: 11 x 18 km), Aleutian Range, 17 ka ±5; more than 50 km3 (12 cu mi) of tephra. Lake Barrine, Atherton Tableland, North Queensland, Australia; was formed over 17 ka. Morne Diablotins, Commonwealth of Dominica; VEI 6; 30 ka (Grand Savanne Ignimbrite). Maninjau Caldera (size: 20 x 8 km), West Sumatra; VEI 7; around 52 ka; 220 to 250 cubic kilometers (52.8 to 60.0 cu mi) of tephra. Lake Toba (size: 100 x 30 km), Sumatra, Indonesia; VEI 8; 73 ka ±4; 2,500 to 3,000 cubic kilometers (599.8 to 719.7 cu mi) of tephra; probably six gigatons of sulfur dioxide were emitted (Youngest Toba Tuff). Atitlán Caldera (size: 17 x 20 km), Guatemalan Highlands; Los Chocoyos eruption; formed in an eruption 84 ka; VEI 7; 300 km3 (72 cu mi) of tephra. Mount Aso (size: 24 km wide), island of Kyūshū, Japan; 90 ka; last eruption was more than 600 cubic kilometers (144 cu mi) of tephra. Sierra La Primavera volcanic complex (size: 11 km wide), Guadalajara, Jalisco, Mexico; 95 ka; 20 cubic kilometers (5 cu mi) of Tala Tuff. Mount Aso (size: 24 km wide), island of Kyūshū, Japan; 120 ka; 80 km3 (19 cu mi) of tephra. Mount Aso (size: 24 km wide), island of Kyūshū, Japan; 140 ka; 80 km3 (19 cu mi) of tephra. Puy de Sancy, Massif Central, central France; it is part of an ancient stratovolcano which has been inactive for about 220,000 years. Emmons Lake Caldera (size: 11 x 18 km), Aleutian Range, 233 ka; more than 50 km3 (12 cu mi) of tephra. Mount Aso (size: 24 km wide), island of Kyūshū, Japan; caldera formed as a result of four huge caldera eruptions; 270 ka; 80 cubic kilometers (19 cu mi) of tephra. Uzon-Geyzernaya calderas (size: 9 x 18 km), Kamchatka Peninsula, Russia; 325-175 ka 20 km3 (4.8 cu mi) of ignimbrite deposits. Diamante Caldera–Maipo volcano complex (size: 20 x 16 km), Argentina-Chile; 450 ka; 450 cubic kilometers (108 cu mi) of tephra. Uinkaret volcanic field, Arizona, USA; the Colorado River was dammed by lava flows multiple times from 725 to 100 ka. Mono County, California, USA; Long Valley Caldera; 758.9 ka ±1.8; VEI 7; 600 cubic kilometers (144 cu mi) of Bishop Tuff. Valles Caldera, New Mexico, USA; around 1.15 Ma; VEI 7; around 600 cubic kilometers (144 cu mi) of the Tshirege formation, Upper Bandelier eruption. Sutter Buttes, Central Valley of California, USA; were formed over 1.5 Ma by a now-extinct volcano. Ebisutoge-Fukuda tephras, Japan; 1.75 Ma; 380 to 490 cubic kilometers (91.2 to 117.6 cu mi) of tephra. Yellowstone hotspot; Island Park Caldera (size: 100 x 50 km); 2.1 Ma; VEI 8; 2,450 cubic kilometers (588 cu mi) of Huckleberry Ridge Tuff. Cerro Galán (size: 32 km wide), Catamarca Province, northwestern Argentina; 2.2 Ma; VEI 8; 1,050 cubic kilometers (252 cu mi) of Cerro Galán Ignimbrite. Approximately 5.332 million years BP, the Pliocene epoch begins. Most eruptions before the Quaternary period have an unknown VEI. Colorado volcanism. Links: La Garita, Cochetopa and North Pass (North Pass), Lake City, and Dotsero. New Mexico volcanism. Links: Valles, Socorro, Potrillo, Carrizozo, and Zuni-Bandera. Boring Lava Field, Boring, Oregon, USA; the zone became active at least 2.7 Ma, and has been extinct for about 300,000 years. Norfolk Island, Australia; remnant of a basaltic volcano active around 2.3 to 3 Ma. Pastos Grandes Caldera (size: 40 x 50 km), Altiplano-Puna volcanic complex, Bolivia; 2.9 Ma; VEI 7; more than 820 cubic kilometers (197 cu mi) of Pastos Grandes Ignimbrite. Little Barrier Island, northeastern coast of New Zealand's North Island; it erupted from 1 million to 3 Ma. Mount Kenya; a stratovolcano created approximately 3 Ma after the opening of the East African rift. Pacana Caldera (size: 60 x 35 km), Altiplano-Puna Volcanic Complex, northern Chile; 4 Ma; VEI 8; 2,500 cubic kilometers (600 cu mi) of Atana Ignimbrite. Frailes Plateau, Bolivia; 4 Ma; 620 cubic kilometers (149 cu mi) of Frailes Ignimbrite E.
Cerro Galán (size: 32 km wide), Catamarca Province, northwestern Argentina; 4.2 Ma; 510 cubic kilometers (122 cu mi) of Real Grande and Cueva Negra tephra. Yellowstone hotspot, Heise volcanic field, Idaho; Kilgore Caldera (size: 80 x 60 km); VEI 8; 1,800 cubic kilometers (432 cu mi) of Kilgore Tuff; 4.45 Ma ±0.05. Khari Khari Caldera, Frailes Plateau, Bolivia; 5 Ma; 470 cubic kilometers (113 cu mi) of tephra. Approximately 23.03 million years BP, the Neogene period and Miocene epoch begin. Cerro Guacha, Bolivia; 5.6-5.8 Ma (Guacha ignimbrite). Lord Howe Island, Australia; Mount Lidgbird and Mount Gower are both made of basalt rock, remnants of lava flows that once filled a large volcanic caldera 6.4 Ma. Yellowstone hotspot, Heise volcanic field, Idaho; 5.51 Ma ±0.13 (Conant Creek Tuff). Yellowstone hotspot, Heise volcanic field, Idaho; 5.6 Ma; 500 cubic kilometers (120 cu mi) of Blue Creek Tuff. Cerro Panizos (size: 18 km wide), Altiplano-Puna Volcanic Complex, Bolivia; 6.1 Ma; 652 cubic kilometers (156 cu mi) of Panizos Ignimbrite. Yellowstone hotspot, Heise volcanic field, Idaho; 6.27 Ma ±0.04 (Walcott Tuff). Yellowstone hotspot, Heise volcanic field, Idaho; Blacktail Caldera (size: 100 x 60 km), Idaho; 6.62 Ma ±0.03; 1,500 cubic kilometers (360 cu mi) of Blacktail Tuff. Pastos Grandes Caldera (size: 40 x 50 km), Altiplano-Puna Volcanic Complex, Bolivia; 8.3 Ma; 652 cubic kilometers (156 cu mi) of Sifon Ignimbrite. Banks Peninsula, New Zealand; Akaroa erupted 9 Ma, Lyttelton erupted 12 Ma. Mascarene Islands were formed in a series of undersea volcanic eruptions 8-10 Ma, as the African plate drifted over the Réunion hotspot. Yellowstone hotspot, Twin Fall volcanic field, Idaho; 8.6 to 10 Ma. Yellowstone hotspot, Picabo volcanic field, Idaho; 10.21 Ma ± 0.03 (Arbon Valley Tuff). Mount Cargill, New Zealand; the last eruptive phase ended some 10 Ma. The center of the caldera is about Port Chalmers, the main port of the city of Dunedin. Yellowstone hotspot, Idaho; Bruneau-Jarbidge volcanic field; 10.0 to 12.5 Ma (Ashfall Fossil Beds eruption). Anahim hotspot, British Columbia, Canada; has generated the Anahim Volcanic Belt over the last 13 million years. Yellowstone hotspot, Owyhee-Humboldt volcanic field, Nevada/ Oregon; around 12.8 to 13.9 Ma. Campi Flegrei, Naples, Italy; 14.9 Ma; 79 cubic kilometers (19 cu mi) of Neapolitan Yellow Tuff. Huaylillas Ignimbrite, Bolivia, southern Peru, northern Chile; 15 Ma ±1; 1,100 cubic kilometers (264 cu mi) of tephra. Yellowstone hotspot, McDermitt volcanic field (North), Trout Creek Mountains, Whitehorse Caldera (size: 15 km wide), Oregon; 15 Ma; 40 cubic kilometers (10 cu mi) of Whitehorse Creek Tuff. Yellowstone hotspot (? ), Lake Owyhee volcanic field; 15.0 to 15.5 Ma. Yellowstone hotspot, McDermitt volcanic field (South), Jordan Meadow Caldera, (size: 10–15 km wide), Nevada/ Oregon; 15.6 Ma; 350 cubic kilometers (84 cu mi) Longridge Tuff member 2-3. Yellowstone hotspot, McDermitt volcanic field (South), Longridge Caldera, (size: 33 km wide), Nevada/ Oregon; 15.6 Ma; 400 cubic kilometers (96 cu mi) Longridge Tuff member 5. Yellowstone hotspot, McDermitt volcanic field (South), Calavera Caldera, (size: 17 km wide), Nevada/ Oregon; 15.7 Ma; 300 cubic kilometers (72 cu mi) of Double H Tuff. Yellowstone hotspot, McDermitt volcanic field (South), Hoppin Peaks Caldera, 16 Ma; Hoppin Peaks Tuff. Yellowstone hotspot, McDermitt volcanic field (North), Trout Creek Mountains, Pueblo Caldera (size: 20 x 10 km), Oregon; 15.8 Ma; 40 cubic kilometers (10 cu mi) of Trout Creek Mountains Tuff. Yellowstone hotspot, McDermitt volcanic field (South), Washburn Caldera, (size: 30 x 25 km wide), Nevada/ Oregon; 16.548 Ma; 250 cubic kilometers (60 cu mi) of Oregon Canyon Tuff. Yellowstone hotspot (? ), Northwest Nevada volcanic field (NWNV), Virgin Valley, High Rock, Hog Ranch, and unnamed calderas; West of Pine Forest Range, Nevada; 15.5 to 16.5 Ma. Yellowstone hotspot, Steens and Columbia River flood basalts, Pueblo, Steens, and Malheur Gorge-region, Pueblo Mountains, Steens Mountain, Washington, Oregon, and Idaho, USA; most vigorous eruptions were from 14–17 Ma; 180,000 cubic kilometers (43,184 cu mi) of lava. Mount Lindesay (New South Wales), Australia; is part of the remnants of the Nandewar extinct volcano that ceased activity about 17 Ma after 4 million years of activity. Oxaya Ignimbrites, northern Chile (around 18°S); 19 Ma; 3,000 cubic kilometers (720 cu mi) of tephra. Pemberton Volcanic Belt was erupting about 21 to 22 Ma. Distribution of selected hotspots. The numbers in the figure are related to the listed hotspots on Hotspot (geology). Paleogene ends 23 million years ago. The formation of the Chilcotin Group basalts occurs between 10-6 million years ago. The formation of the Columbia River Basalt Group occurs between 17 and 6 million years ago. La Garita Caldera erupts in the Wheeler Geologic Area, Central Colorado volcanic field, Colorado, USA, eruption several VEI8 events (Possibly as high as a VEI9), 5,000 cubic kilometers (1,200 cu mi) of Fish Canyon Tuff was blasted out in a major single eruption about 27.8 million years ago. Unknown source in Ethiopia erupts 29 million years ago with at least 3,000 cubic kilometers (720 cu mi) of Green Tuff and SAM. Sam Ignimbrite in Yemen forms 29.5 million years ago, at least 5,550 cubic kilometers (1,332 cu mi) of distal tuffs associated with the ignimbrites. Jabal Kura’a Ignimbrite in Yemen forms 29.6million years ago, at least 3,700 cubic kilometers (888 cu mi) of distal tuffs associated with the ignimbrites. The Mid-Tertiary ignimbrite flare-up begins 40 million years ago and last till 25 million years ago. Bennett Lake Volcanic Complex erupts 50 million years ago with a VEI7 850 cubic kilometers (204 cu mi) of tephra. Canary hotspot is believed to have first appeared about 60 million years ago. Formation of the Brito-Arctic province begins 61 million years ago. Réunion hotspot, Deccan Traps, India, formed between 60 and 68 million years ago which are thought to have played a role in the K-Pg extinction. The Louisville hotspot has produced the Louisville Ridge, it is active for at least 80 million years. It may have originated the Ontong Java Plateau around 120 million years ago. Hawaii hotspot, Meiji Seamount is the oldest extant seamount in the Hawaiian-Emperor seamount chain, with an estimated age of 82 million years. The Kerguelen Plateau begins forming 110 million years ago. The Rahjamal Traps form from 117-116 million years ago. Paraná and Etendeka traps, Brazil, Namibia and Angola form 128 to 138 million years ago. 132 million years ago, a possible supervolcanic eruption occurred, ejecting 8,600 cubic kilometers (2,063 cu mi). Formation of the Karoo-Ferrar flood basalts begins 183 million years ago. The flood basalts of the Central Atlantic magmatic province are thought to have contributed to the Triassic–Jurassic extinction event about 199 million years ago. The Siberian Traps are thought to have played a significant role in the Permian–Triassic extinction event 252 million years ago. Formation of the Emeishan Traps began 260 million years ago. The Late Devonian extinction occurs about 374 million years ago. The Ordovician–Silurian extinction event occurs between 450 and 440 million years ago. Scafells, Lake District, England; VEI8; Ordovician (488.3 - 443.7 million years ago). Mackenzie Large Igneous Province forms 1,270 million years ago. Mistassini dike swarm and Matachewan dike swarm form 2,500 million years ago. Blake River Megacaldera Complex forms 2,704-2,707 million years ago. The Mackenzie Large Igneous Province contains the largest and best-preserved continental flood basalt terrain on Earth. The Mackenzie dike swarm throughout the Mackenzie Large Igneous Province is also the largest dike swarm on Earth, covering an area of 2,700,000 km2 (1,000,000 sq mi). The Bachelor (27.4 Ma), San Luis (27-26.8 Ma), and Creede (26 Ma) calderas partially overlap each other and are nested within the large La Garita (27.6 Ma) caldera, forming the central caldera cluster of the San Juan volcanic field, Wheeler Geologic Area, La Garita Wilderness. Creede, Colorado and San Luis Peak (Continental Divide of the Americas) are nearby. North Pass Caldera is northeastern the San Juan Mountains, North Pass. The Platoro volcanic complex lies southeastern of the central caldera cluster. The center of the western San Juan caldera cluster lies just West of Lake City, Colorado. The Rio Grande rift includes the San Juan volcanic field, the Valles Caldera, the Potrillo volcanic field, and the Socorro-Magdalena magmatic system. The Socorro Magma Body is uplifting the surface at approximately 2 mm/year. The southwestern Nevada volcanic field, or Yucca Mountain volcanic field, includes: Stonewall Mountain caldera complex, Black Mountain Caldera, Silent Canyon Caldera, Timber Mountain - Oasis Valley caldera complex, Crater Flat Group, and Yucca Mountain. Towns nearby: Beatty, Mercury, Goldfield. It is aligned as a Crater Flat volcanic field, Réveille Range, Lunar Crater volcanic field, Zone (CFLC). The Marysvale Volcanic Field, southwestern Utah is nearby too. McDermitt volcanic field, or Orevada rift volcanic field, Nevada/ Oregon, nearby are: McDermitt, Trout Creek Mountains, Bilk Creek Mountains, Steens Mountain, Jordan Meadow Mountain (6,816 ft), Long Ridge, Trout Creek, and Whitehorse Creek. Emmons Lake stratovolcano (caldera size: 11 x 18 km), Aleutian Range, was formed through six eruptions. Mount Emmons, Mount Hague, and Double Crater are post-caldera cones. The topography of the Basin and Range Province is a result of crustal extension within this part of the North American Plate (rifting of the North American craton or Laurentia from Western North America; e.g. Gulf of California, Rio Grande rift, Oregon-Idaho graben). The crust here has been stretched up to 100% of its original width. In fact, the crust underneath the Basin and Range, especially under the Great Basin (includes Nevada), is some of the thinnest in the world. Topographically visible calderas: South part of the McDermitt volcanic field (four overlapping and nested calderas), West of McDermitt; Cochetopa Park Caldera, West of the North Pass; Henry's Fork Caldera; Banks Peninsula, New Zealand (Photo) and Valles Caldera. Newer drawings show McDermitt volcanic field (South), as five overlapping and nested calderas. Hoppin Peaks Caldera is included too. Repose periods: Toba (0.38 Ma), Valles Caldera (0.35 Ma), Yellowstone Caldera (0.7 Ma). Kiloannum (ka), is a unit of time equal to one thousand years. Megaannum (Ma), is a unit of time equal to one million years, one can assume that "ago" is implied. But very large sulfur dioxide emissions overdrive the oxidizing capacity of the atmosphere. Carbon monoxide's and methane's concentration goes up (greenhouse gases), global temperature goes up, ocean's temperature goes up, and ocean's carbon dioxide solubility goes down. Location of Mount Pinatubo, showing area over which ash from the 1991 eruption fell. NASA, Global Dimming - El Chichon, VEI 5; Pinatubo, VEI 6. Sulfur dioxide emissions by volcanoes. Mount Pinatubo: 20 million tons of sulfur dioxide. TOMS sulfur dioxide from the June 15, 1991 eruption of Mount Pinatubo. Sarychev Peak: the sulphur dioxide cloud generated by the eruption on June 12, 2009 (in Dobson units). Diagram of Island Park and Henry's Fork Caldera. Harney Basin, Steens Mountain, Owyhee and Malheur River. Steens Mountain, McDermitt volcanic field and Oregon/ Nevada stateline. Location of Yellowstone Hotspot in Millions of Years Ago. Location of Yucca Mountain in southern Nevada, to the West of the Nevada Test Site. Jemez Ranger District and Jemez Mountains, Santa Fe National Forest. ^ a b Ward, Peter L. (2 April 2009). "Sulfur Dioxide Initiates Global Climate Change in Four Ways". Thin Solid Films. 517 (11): 3188–3203. Bibcode:2009TSF...517.3188W. doi:10.1016/j.tsf.2009.01.005. ^ "Holocene Kamchatka volcanoes. Institute of Volcanology and Seismology". www.kscnet.ru. Retrieved 2018-04-30. ^ a b c d e f g h i j k l m n o p q r s t u v w x y z aa ab ac ad ae af "Supplementary Table to P.L. Ward, Thin Solid Films (2009) Major volcanic eruptions and provinces" (PDF). Teton Tectonics. Archived from the original (PDF) on 2010-01-20. Retrieved 2010-03-16. ^ "International Stratigraphic Chart" (PDF). International Commission on Stratigraphy. Archived from the original (PDF) on 2009-12-29. Retrieved 2009-12-23. ^ Brantley, Steven R. (1999-01-04). Volcanoes of the United States. Online Version 1.1. United States Geological Survey. p. 30. ISBN 978-0-16-045054-9. OCLC 156941033. Retrieved 2008-09-12. ^ Judy Fierstein; Wes Hildreth; James W. Hendley II; Peter H. Stauffer (1998). "Can Another Great Volcanic Eruption Happen in Alaska? - U.S. Geological Survey Fact Sheet 075-98". Version 1.0. United States Geological Survey. Retrieved 2008-09-10. ^ Fierstein, Judy; Wes Hildreth (2004-12-11). "The plinian eruptions of 1912 at Novarupta, Katmai National Park, Alaska". Bulletin of Volcanology. Springer. 54 (8): 646–684. Bibcode:1992BVol...54..646F. doi:10.1007/BF00430778. ^ "Santa Maria". Global Volcanism Program. Smithsonian Institution. Retrieved 2010-03-19. ^ Hopkinson, Deborah (January 2004). "The Volcano That Shook the world: Krakatoa 1883". 11 (4). New York: Storyworks. Scholastic.com: 8. ^ Bristol, University of. "September: Unknown eruption - News - University of Bristol". www.bris.ac.uk. ^ "Undocumented volcano contributed to extremely cold decade from 1810-1819". ^ Guevara-Murua, A.; Williams, C. A.; Hendy, E. J.; Rust, A. C.; Cashman, K. V. (2014). "Observations of a stratospheric aerosol veil from a tropical volcanic eruption in December 1808: is this the "Unknown" ~1809 eruption?". Climate of the Past Discussions. 10 (2): 1901–1932. Bibcode:2014CliPD..10.1901G. doi:10.5194/cpd-10-1901-2014. ISSN 1814-9359. ^ "BBC Two - Timewatch". BBC. ^ Sigurdsson Haraldur; Carey S.; Mandeville C. (1990). "Assessment of mass, dynamics and environmental effects of the Minoan eruption of the Santorini volcano". Thera and the Aegean World III: Proceedings of the Third Thera Conference. II: 100–12. ^ "Huaynaputina". Global Volcanism Program. Smithsonian Institution. Retrieved 2008-12-29. ^ Nemeth, Karoly; Shane J. Cronin; James D.L. White (2007). "Kuwae caldera and climate confusion". The Open Geology Journal. 1 (5): 7–11. Bibcode:2007OGJ.....1....7N. doi:10.2174/1874262900701010007. ^ Gao, Chaochao; A. Robock; S. Self; J. B. Witter; J. P. Steffenson; H. B. Clausen; M.-L. Siggaard-Andersen; S. Johnsen; P. A. Mayewski; C. Ammann (27 June 2006). "The 1452 or 1453 A.D. Kuwae eruption signal derived from multiple ice core records: Greatest volcanic sulfate event of the past 700 years". Journal of Geophysical Research. 111 (D12): D12107. Bibcode:2006JGRD..11112107G. doi:10.1029/2005JD006710. Retrieved 2010-03-19. ^ Witter, J.B.; Self S. (January 2007). "The Kuwae (Vanuatu) eruption of AD 1452: potential magnitude and volatile release". Bulletin of Volcanology. 69 (3): 301–318. Bibcode:2007BVol...69..301W. doi:10.1007/s00445-006-0075-4. ^ Lavigne, Franck (4 September 2013). "Source of the great A.D. 1257 mystery eruption unveiled, Samalas volcano, Rinjani Volcanic Complex, Indonesia". Proceedings of the National Academy of Sciences of the United States of America. 110 (42): 16742–7. Bibcode:2013PNAS..11016742L. doi:10.1073/pnas.1307520110. PMC 3801080. PMID 24082132. Retrieved 1 October 2013. ^ "Mystery 13th Century eruption traced to Lombok, Indonesia". BBC News. 30 September 2013. Retrieved 1 October 2013. ^ Lavigne, Franck; et al. (2013). "Source of the great A.D. 1257 mystery eruption unveiled, Samalas volcano, Rinjani Volcanic Complex, Indonesia". PNAS. 110 (42): 16742–16747. Bibcode:2013PNAS..11016742L. doi:10.1073/pnas.1307520110. PMC 3801080. PMID 24082132. ^ Baales, Michael; Jöris, Olaf; Street, Martin; Bittmann, Felix; Weninger, Bernhard; Wiethold, Julian (November 2002). "Impact of the Late Glacial Eruption of the Laacher See Volcano, Central Rhineland, Germany". Quaternary Research. 58 (3): 273–288. Bibcode:2002QuRes..58..273B. doi:10.1006/qres.2002.2379. ^ Carey, Steven N.; Sigurdsson, Haraldur (1980). "The Roseau Ash: Deep-sea Tephra Deposits from a Major Eruption on Dominica, Lesser Antilles Arc". Journal of Volcanology and Geothermal Research. 7 (1–2): 67–86. Bibcode:1980JVGR....7...67C. doi:10.1016/0377-0273(80)90020-7. ^ Alloway, Brent V.; Agung Pribadi; John A. Westgate; Michael Bird; L. Keith Fifield; Alan Hogg; Ian Smith (30 October 2004). "Correspondence between glass-FT and 14C ages of silicic pyroclastic flow deposits sourced from Maninjau caldera, west-central Sumatra". Earth and Planetary Science Letters. Elsevier. 227 (1–2): 121–133. Bibcode:2004E&PSL.227..121A. doi:10.1016/j.epsl.2004.08.014. ^ Twickler and K. Taylor, G. A.; Mayewski, P. A.; Meeker, L. D.; Whitlow, S.; Twickler, M. S.; Taylor, K. (1996). "Potential Atmospheric impact of the Toba mega-eruption ~71'000 years ago". Geophysical Research Letters. American Geophysical Union. 23 (8): 837–840. Bibcode:1996GeoRL..23..837Z. doi:10.1029/96GL00706. ^ a b Chesner, C.A. ; Westgate, J.A. ; Rose, W.I. ; Drake, R.; Deino, A. (March 1991). "Eruptive History of Earth's Largest Quaternary caldera (Toba, Indonesia) Clarified" (PDF). Geology. 19 (3): 200–203. Bibcode:1991Geo....19..200C. doi:10.1130/0091-7613(1991)019<0200:EHOESL>2.3.CO;2. Retrieved 2010-01-20. ^ "Guatemala Volcanoes and Volcanics". USGS - CVO. Retrieved 2010-03-13. ^ "Cities on Volcanoes 5". www.eri.u-tokyo.ac.jp. ^ "Sierra la Primavera". Global Volcanism Program. Smithsonian Institution. Retrieved 2010-03-24. ^ "GEOLOGIC SETTING OF THE UZON CALDERA, KAMCHATKA, FAR EAST RUSSIA". gsa.confex.com. ^ Sruoga, Patricia; Eduardo J. Llambías; Luis Fauqué; David Schonwandt; David G. Repol (September 2005). "Volcanological and geochemical evolution of the Diamante Caldera–Maipo volcano complex in the southern Andes of Argentina (34°10′S)". Journal of South American Earth Sciences. 19 (4): 399–414. Bibcode:2005JSAES..19..399S. doi:10.1016/j.jsames.2005.06.003. ^ Karlstrom, K.; Crow, R.; Peters, L.; McIntosh, W.; Raucci, J.; Crossey, L.; Umhoefer, P. (2007). "40Ar/39Ar and field studies of Quaternary basalts in Grand Canyon and model for carving Grand Canyon: Quantifying the interaction of river incision and normal faulting across the western edge of the Colorado Plateau". GSA Bulletin. 119 (11/12): 1283–1312. Bibcode:2007GSAB..119.1283K. doi:10.1130/0016-7606(2007)119[1283:AAFSOQ]2.0.CO;2. ^ Hildreth, W. (1979), Sarna-Wojcicki et al. (2000). ^ Izett, Glen A. (1981). ^ Heiken et al. (1990). ^ a b Ben G. Mason; David M. Pyle; Clive Oppenheimer (2004). "The size and frequency of the largest explosive eruptions on Earth". Bulletin of Volcanology. 66 (8): 735–748. Bibcode:2004BVol...66..735M. doi:10.1007/s00445-004-0355-9. ^ Wood, Charles A.; Jűrgen Kienle (1990). Volcanoes of North America. Cambridge University Press. pp. 170–172. ^ Geological origins Archived 2008-09-07 at the Wayback Machine, Norfolk Island Tourism. Accessed 2007-04-13. ^ Ort, M. H.; de Silva, S.; Jiminez, N.; Salisbury, M.; Jicha, B. R. and Singer, B. S. (2009). Two new supereruptions in the Altiplano-Puna Volcanic Complex of the Central Andes. ^ Lindsay, Jan M.; Tim J. Worthington; Ian E. M. Smith; Philippa M. Black (June 1999). "Geology, petrology, and petrogenesis of Little Barrier Island, Hauraki Gulf, New Zealand" (PDF). New Zealand Journal of Geology and Geophysics. 42 (2): 155–168. doi:10.1080/00288306.1999.9514837. Archived from the original (PDF) on November 1, 2004. Retrieved 2007-12-03. ^ Lindsay J. M.; de Silva S.; Trumbull R.; Emmermann R.; Wemmer K. (2001). "La Pacana caldera, N. Chile: a re-evaluation of the stratigraphy and volcanology of one of the world's largest resurgent calderas". Journal of Volcanology and Geothermal Research. 106 (1–2): 145–173. Bibcode:2001JVGR..106..145L. doi:10.1016/S0377-0273(00)00270-5. ^ a b c d e Morgan, Lisa A. Morgan; William C. McIntosh (March 2005). "Timing and development of the Heise volcanic field, Snake River Plain, Idaho, western USA" (PDF). GSA Bulletin. 117 (3–4): 288–306. Bibcode:2005GSAB..117..288M. doi:10.1130/B25519.1. Retrieved 2010-03-16. ^ Salisbury, M. J.; Jicha, B. R.; de Silva, S. L.; Singer, B. S.; Jimenez, N. C.; Ort, M. H. (21 December 2010). "40Ar/39Ar chronostratigraphy of Altiplano-Puna volcanic complex ignimbrites reveals the development of a major magmatic province". Geological Society of America Bulletin. 123 (5–6): 821–840. Bibcode:2011GSAB..123..821S. doi:10.1130/B30280.1. Retrieved 29 November 2015. ^ a b c d e f "Mark Anders: Yellowstone hotspot track". Columbia University, Lamont-Doherty Earth Observatory (LDEO). Retrieved 2010-03-16. ^ Coombs, D. S., Dunedin Volcano, Misc. Publ. 37B, pp. 2–28, Geol. Soc. of N. Z., Dunedin, 1987. ^ Coombs, D. S., R. A. Cas, Y. Kawachi, C. A. Landis, W. F. Mc-Donough, and A. Reay, Cenozoic volcanism in north, east and central Otago, Bull. R. Soc. N. Z., 23, 278–312, 1986. ^ Bishop, D.G., and Turnbull, I.M. (compilers) (1996). Geology of the Dunedin Area. Lower Hutt, NZ: Institute of Geological & Nuclear Sciences. ISBN 0-478-09521-X. ^ Sawyer, David A.; R. J. Fleck; M. A. Lanphere; R. G. Warren; D. E. Broxton; Mark R. Hudson (October 1994). "Episodic caldera volcanism in the Miocene southwestern Nevada volcanic field: Revised stratigraphic framework, 40Ar/39Ar geochronology, and implications for magmatism and extension". Geological Society of America Bulletin. 106 (10): 1304–1318. Bibcode:1994GSAB..106.1304S. doi:10.1130/0016-7606(1994)106<1304:ECVITM>2.3.CO;2. Retrieved 2010-03-26. ^ a b c d e f Lipman, P.W. (September 30, 1984). "The Roots of Ash Flow Calderas in Western North America: Windows Into the Tops of Granitic Batholiths". Journal of Geophysical Research. 89 (B10): 8801–8841. Bibcode:1984JGR....89.8801L. doi:10.1029/JB089iB10p08801. ^ Rytuba, James J.; John, David A.; McKee, Edwin H. (May 3–5, 2004). "Volcanism Associated with Eruption of the Steens Basalt and Inception of the Yellowstone Hotspot". Rocky Mountain (56th Annual) and Cordilleran (100th Annual) Joint Meeting. Paper No. 44-2. Retrieved 2010-03-26. ^ a b Rytuba, J.J.; McKee, E.H. (1984). "Peralkaline ash flow tuffs and calderas of the McDermitt Volcanic Field, southwest Oregon and north central Nevada". Journal of Geophysical Research. 89 (B10): 8616–8628. Bibcode:1984JGR....89.8616R. doi:10.1029/JB089iB10p08616. Retrieved 2010-03-23. ^ Matthew A. Coble & Gail A. Mahood (2008). "New geologic evidence for additional 16.5-15.5 Ma silicic calderas in northwest Nevada related to initial impingement of the Yellowstone hot spot" (PDF). Earth and Environmental Science 3. Collapse Calderas Workshop, IOP Conf. Series. 3: 012002. doi:10.1088/1755-1307/3/1/012002. Retrieved 2010-03-23. ^ Carson, Robert J.; Pogue, Kevin R. (1996). Flood Basalts and Glacier Floods:Roadside Geology of Parts of Walla Walla, Franklin, and Columbia Counties, Washington. Washington State Department of Natural Resources (Washington Division of Geology and Earth Resources Information Circular 90). ^ Reidel, Stephen P. (2005). "A Lava Flow without a Source: The Cohasset Flow and Its Compositional Members". The Journal of Geology. 113 (1): 1–21. Bibcode:2005JG....113....1R. doi:10.1086/425966. ^ Brueseke, M.E. ; Heizler, M.T. ; Hart, W.K. ; S.A. Mertzman (15 March 2007). "Distribution and geochronology of Oregon Plateau (U.S.A.) flood basalt volcanism: The Steens Basalt revisited". Journal of Volcanology and Geothermal Research. 161 (3): 187–214. Bibcode:2007JVGR..161..187B. doi:10.1016/j.jvolgeores.2006.12.004. ^ "Oregon: A Geologic History. 8. Columbia River Basalt: the Yellowstone hot spot arrives in a flood of fire". Oregon Department of Geology and Mineral Industries. Retrieved 2010-03-26. ^ Madsen, J.K.; Thorkelson, D.J. ; Friedman, R.M. ; Marshall, D.D. (6 May 2018). "Cenozoic to Recent plate configurations in the Pacific Basin: Ridge subduction and slab window magmatism in western North America". Geosphere. 2 (1): 11. Bibcode:2006Geosp...2...11M. doi:10.1130/ges00020.1. ^ Olivier Bachmann; Michael A. Dungan; Peter W. Lipman (2002). "The Fish Canyon Magma Body, San Juan Volcanic Field, Colorado: Rejuvenation and Eruption of an Upper-Crustal Batholith". Journal of Petrology. 43 (8): 1469–1503. Bibcode:2002JPet...43.1469B. doi:10.1093/petrology/43.8.1469. Retrieved 2010-03-16. ^ a b Ingrid Ukstins Peate; Joel A. Baker; Mohamed Al-Kadasi; Abdulkarim Al-Subbary; Kim B. Knight; Peter Riisager; Matthew F. Thirlwall; David W. Peate; Paul R. Renne; Martin A. Menzies (2005). "Volcanic stratigraphy of large-volume silicic pyroclastic eruptions during Oligocene Afro-Arabian flood volcanism in Yemen". Bulletin of Volcanology. 68 (2): 135–156. Bibcode:2005BVol...68..135P. doi:10.1007/s00445-005-0428-4. .
^ "Muskox Property - The Muskox Intrusion". Archived from the original on 2009-04-08. ^ "Westward Migrating Ignimbrite Calderas and a Large Radiating Mafic Dike Swarm of Oligocene Age, Central Rio Grande Rift, New Mexico: Surface Expression of an Upper Mantle Diapir?" (PDF). New Mexico Tech. Retrieved 2010-03-21. ^ Fialko, Y., and M. Simons, Evidence for on-going inflation of the Socorro magma body, New Mexico, from interferometric synthetic aperture radar imaging Geop. Res. Lett., 28, 3549-3552, 2001. ^ "Socorro Magma Body". New Mexico Tech. Archived from the original on 2010-06-15. Retrieved 2010-03-21. ^ "Figure: Calderas within southwestern Nevada volcanic field". Los Alamos National Laboratory. Retrieved 2010-03-16. ^ Smith, E.I. & D.L. Keenan (30 August 2005). "Yucca Mountain Could Face Greater Volcanic Threat" (PDF). Eos, Transactions, American Geophysical Union. 86 (35): 317. Bibcode:2005EOSTr..86..317S. doi:10.1029/2005eo350001. Retrieved 5 April 2016. ^ Doell, R.R., Dalrymple, G.B., Smith, R.L., and Bailey, R.A., 1986, Paleomagnetism, potassium-argon ages, and geology of rhyolite and associated rocks of the Valles Caldera, New Mexico: Geological Society of America Memoir 116, p. 211-248. ^ Izett, G.A., Obradovich, J.D., Naeser, C.W., and Cebula, G.T., 1981, Potassium-argon and fission-track ages of Cerro Toledo rhyolite tephra in the Jemez Mountains, New Mexico, in Shorter contributions to isotope research in the western United States: U.S. Geological Survey Professional Paper 1199-D, p. 37-43. ^ Christiansen, R.L., and Blank, H.R., 1972, Volcanic stratigraphy of the Quaternary rhyolite plateau in Yellowstone National Park: U.S. Geological Survey Professional Paper 729-B, p. 18. ^ Salzer, Matthew W.; Malcolm K. Hughes (2007). "Bristlecone pine tree rings and volcanic eruptions over the last 5000 yr" (PDF). Quaternary Research. 67 (1): 57–68. Bibcode:2007QuRes..67...57S. doi:10.1016/j.yqres.2006.07.004. Retrieved 2010-03-18. ^ "VEI glossary entry". USGS. Retrieved 2010-03-30. ^ "Volcanic Sulfur Aerosols Affect Climate and the Earth's Ozone Layer - Volcanic ash vs sulfur aerosols". U.S. Geological Survey. Retrieved 2010-04-21. ^ Dai, Jihong; Ellen Mosley-Thompson; Lonnie G. Thompson (1991). "Ice core evidence for an explosive tropical volcanic eruption six years preceding Tambora". Journal of Geophysical Research: Atmospheres. 96 (D9): 17, 361–17, 366. Bibcode:1991JGR....9617361D. doi:10.1029/91jd01634. ^ "Mt. Pinatubo's cloud shades global climate". Science News. Retrieved 2010-03-07. ^ Jones, P.D., Wigley, T.M.I, and Kelly, P.M. (1982), Variations in surface air temperatures: Part I. Northern Hemisphere, 1881-1980: Monthly Weather Review, v.110, p. 59-70. Ammann, Caspar M.; Philippe Naveau (6 March 2003). "Statistical analysis of tropical explosive volcanism occurrences over the last 6 centuries" (PDF). Geophysical Research Letters. 30 (5): 1210. Bibcode:2003GeoRL..30.1210A. doi:10.1029/2002GL016388. Retrieved 2010-03-19. Froggatt, P.C. ; Lowe, D.J. (1990). "A review of late Quaternary silicic and some other tephra formations from New Zealand: their stratigraphy, nomenclature, distribution, volume, and age". New Zealand Journal of Geology and Geophysics. 33: 89–109. doi:10.1080/00288306.1990.10427576. Archived from the original on October 21, 2008. Retrieved 2010-03-19. Lipman, P.W. (September 30, 1984). "The Roots of Ash Flow Calderas in Western North America: Windows Into the Tops of Granitic Batholiths". Journal of Geophysical Research. 89 (B10): 8801–8841. Bibcode:1984JGR....89.8801L. doi:10.1029/JB089iB10p08801. Siebert L., and Simkin T. (2002-). Volcanoes of the World: an Illustrated Catalog of Holocene Volcanoes and their Eruptions. Smithsonian Institution, Global Volcanism Program, Digital Information Series, GVP-3, (http://www.volcano.si.edu/). Simkin T. & Siebert L. (1994). Volcanoes of the World. Geoscience Press, Tucson, 2nd edition. p. 349. ISBN 978-0-945005-12-4. Simkin, T.; Siebert L.; McClelland L.; Bridge D.; Newhall C.; Latter J.H. (1981). 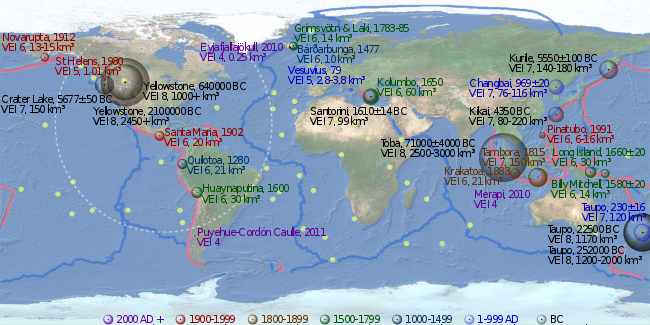 Volcanoes of the World: A Regional Directory, Gazetteer, and Chronology of Volcanism During the Last 10,000 Years. Hutchinson-Ross, Stroudsburg, Pennsylvania. p. 232. ISBN 978-0-87933-408-6. Stern, Charles R. (December 2004). "Active Andean volcanism: its geologic and tectonic setting". Revista Geológica de Chile. 31 (2): 161–206. doi:10.4067/S0716-02082004000200001. Retrieved 2010-03-17.